Kama's Vetiver water is steam distilled from the roots of perennial Vetiver grass native to Aligarh Region in north India . Vetiver water is a pure face and body mist that is cooling, earthy and refreshing.It is a natural astringent which hydrates and balances the pH balance of the skin, tightens the pores and relaxes the mind. The steam distillation process used to create this wonderful vetiver water ensures a high level of hygiene and purity. Explore the entire range of Toners & Mists available on Nykaa. 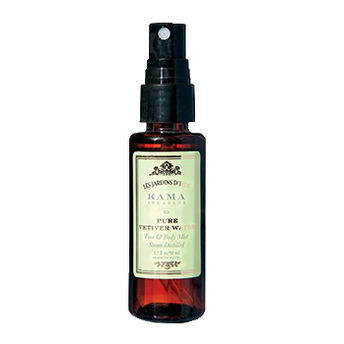 Shop more Kama Ayurveda products here.You can browse through the complete world of Kama Ayurveda Toners & Mists .Alternatively, you can also find many more products from the Kama Ayurveda Pure Vetiver Water range.